Action Hero Biju may lack the fire and brimstone of the police stories we have grown up watching, but it is surely a sincere effort to be different and realistic, which has to be acknowledged, writes Paresh C Palicha. What is the role of a policeman in the society? Ok, we think it is to safeguard people and their property of the locality he is in charge of. But, our films tend to show only the extremes; either make a superhero out of him who takes on the corrupt system single-handedly and walks away in slow motion after blowing up the bad guys in the end or the link in the nexus between the politician, police and the criminal, a dark and grumpy persona without an iota of humanness in his personality. 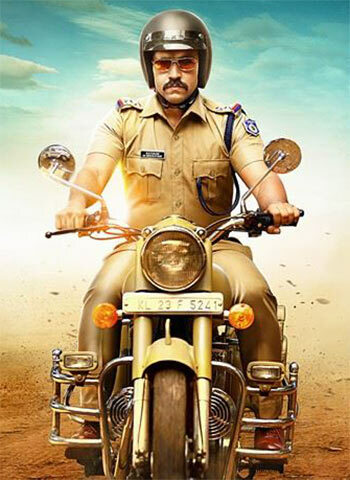 So, when you settle down to see Action Hero Biju, where Nivin Pauly (his first release after the gigantic hit Premam last year) plays a police officer, you expect him to be like Mammootty or Suresh Gopi who have mastered the art of doing such super hero police roles. But credit should be given to the director Abrid Shine (who is also credited with the story) for not falling into the trap of spoofing the superheroes of the past or even making his hero emulate them. He just tries to show how mundane the job of a sub inspector of police is. You can call this a 'new gen' police story where our man Biju Paulose (Nivin Pauly) has to sign the vouchers for the expenses incurred by his subordinates on the previous day. He does raise his voice in front of petty politicians and applies third degree measures on seasoned criminals and drug peddlers without leaving a mark on their bodies for the medical examiners or the Judges to detect. But in front of the common people, he is a model police officer, listening to their grievances patiently and providing solutions to them if they are within his ambit. Now, about Biju. He is a post graduate and has left the cosy job of teaching to serve the society in a better way. If we look at the story, it is a tad repetitive in the first half where he is seen talking to people sitting in his office providing solutions to their myriad problems, whether its a domestic problem like a messy extra-marital affair or school kids entangled in the web of drug mafia. Some of these situations do have the scope for humour and they are exploited well too. But, there is hardly anything to justify the words 'Action Hero' used in the title. The action comes in the fag end of the film when he takes on the gang of a goonda, which reminds us of the pathbreaking Tamil film Subramaniapuram (2008). Most of the supporting cast have cameo roles other than perhaps Joju Gorge and couple of others who appear as Biju's colleagues and subordinates, and get substantial screen time with him. Even Anu Emanuel who has grown up to be the leading lady after being a child star in the past, appears in episodic manner and has only a full blown romantic song as the fiancée of our hero. Action Hero Biju may lack the fire and brimstone of the police stories we have grown up watching, but surely it is a sincere effort to be different and realistic, which has to be acknowledged.